On behalf of the riders, we would like to thank Atlantis Seafoods, Wexford and Ryan’s Supervalu, Glanmire for kindly sponsoring the Riders’ Reception last night. It was great fun and an opportunity to catch up with old friends and make a few new ones! The competition got off to a great start today in glorious sunshine and we’re looking forward to more great dressage tomorrow. Sarah Ennis, riding BLM Diamond Delux, is leading the CCI*** class after dressage on a score of 45.2, with Belgium’s Constantin van Rijckvorsel and Goodwins Reef lying second on 50.2. Hot on their heels (and with less than a penalty point between them) are Katie O’Sullivan (IRL), Olivia Wilmot (GBR), Matthew Wright (GBR) and Constantin on his second horse, Butterfly Boy. In the CCI** class, Vittoria Panizzon, representing Italy and our Castlemartyr Challenge winner, is at the top of the leaderboard on 39.6, having done a lovely dressage test today on Merlots Magic. Olivia Wilmot (GBR), riding Zebedee de Foja, is in second place on 45.0. Again there’s less than a penalty point separating the next three placings, Oliver Townend (GBR), Andy Daines (NZL) and Frances Whittington (GBR). Best of the Irish heading out cross country is Brian Morrison, riding Fenyas Elegance, currently in 7th place. The van Rijckevorsel family are having a very busy week! Therese (SWE) is top of the leaderboard in the CCI* class on 43.8, with Buzzy Bee du Langwater, while Constantin is lying in 4th place on 46.7 with Rural Dean. Sandwiched between them are Italy’s Vittoria Panizzon on River Vally Robert and Ireland’s Alison Holden on Maximus Orelius! We also saw some CIC*** tests today and that class will finish tomorrow. In the lead overnight is Oliver Townend with Imperial Master (40.2), with Katie O’Sullivan and Kilpatrick Dancer lying 2nd on 44.7. 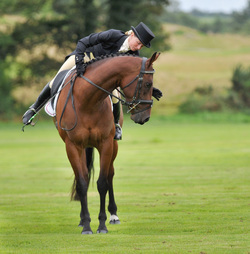 The remaining dressage takes place tomorrow so two more sleeps to cross country day!